The rarest tiger in existence, South China Tiger or South Chinese Tiger is one of the ten most endangered animals in the world. Threatened with imminent extinction, this tiger has dwindled in number from thousands to tens in a space of few decades. Considered the stem tiger or the original tiger from which all other tigers of today have originated, Panthera Tigris Amoyensis, also known as Amoy Tiger or Xiamen Tiger, has not been seen in the wild for past twenty five years. One of the smaller tiger subspecies, the South China Tiger weighs around three hundred and thirty pounds in case of males and two hundred and forty pounds for females. Average length is eight feet for males and seven and a half feet in case of females. Color is reddish orange and underparts are white. The dark stripes are short and spaced relatively broadly in comparison to other tigers. Tail appears to end rather abruptly than taper off as in case of other tiger subspecies. In the past when South China Tigers were studied in the wild, they were known to inhabit moist forests in rocky terrains. They used to hunt a variety of prey species though predominant prey were probably ungulates. Livestock were also reportedly taken at times and human beings attacked by the big cats. They were nocturnal and perhaps solitary cats. 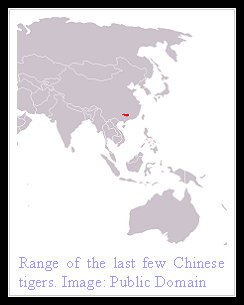 Their range was dense jungles of south-central China in an area bordering different provinces. Though various fragmented reserves exist in the past range of South China Tiger no tiger has been documented for decades in these parts. There are reports of paw prints, hearing of roars and rare sightings but no solid proof exists that tigers still inhabit the woods of a country that once was home to four different subspecies of tigers. Experts believe that at the most there could be twenty to thirty of the Amoy Tigers in the wild but fear these too are on the brink of extinction owing to severe inbreeding. Gestational period for South Chinese Tigers is three and a half months following which a litter of one to five cubs is born in the wild. The young begin to accompany the mother on hunts at two months of age and learn hunting at six months. They gain independence between one and one and a half years of age. The fate of South China Tiger was sealed nearly half a century ago when in the late fifties Mao Zedong declared them as pests and ordered their extermination. When the Chinese Government realized its mistake a couple of decades later it was already too late. No tiger was ever seen in the wild again. The ones in captivity suffer from inbreeding as do any tigers that still might possibly exist in the wild. Poaching, loss of prey and habitat have taken a heavy toll on the already dwindling numbers of this great cat. 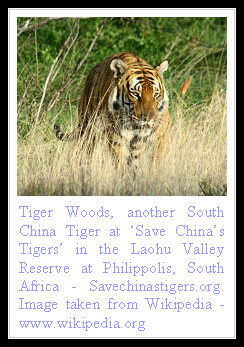 Authorities in China are taking some positive measures now and re-wilding projects are being planned with prospects of a few of these tigers to be released and bred in the wild in South Africa. 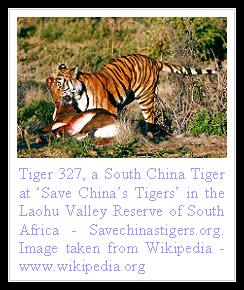 The offsprings of these cats could then be reintroduced in China with tougher laws and better protection for the tigers. The current classification for the oldest tiger subspecie, the South China Tiger, is Extinct in the Wild! Thank you very much! THIS HELPED SOOO MUCH WITH MY PROJECT!! Is it just me, or to these tiger's colors seem brighter? On a tour of the Yangtze Gorges, with my wife, Ren Wanghua. of Chongqing, on the lessor three gorge Shinong Stream, I believe, I saw a tiger,on a ledge of the cliffs on the river bank. Many Chinese tourists saw it and were very excited. This was a couple of years ago. im doing a school project and this site helped alot thanks! The case study sample times and analyze the situation thoroughly. Make notes, look up for the important facts and highlight the crucial points. Our website is number 1 in Assignment Provider, Assignment Help for University Students in UK, USA, Australia, and Malaysia. You Can Ask Every Thing You Want. Our Team Work 24/7.Assignment Help Provider.